I had hoped to do more blogging, but it takes time. Time which I could put towards writing, thus no updates for a few days. If you read nothing else, scroll down to the bottom for a great snack! In general, I’m behind. I had a good run at the beginning, but the weekend killed me. My wife and I had something going on Fri night and Sat, so I didn’t get much in then. I ended up taking Sun off as well, which left me with 6,630 out of 10,002 that I really needed. Blah. The last few days have been pretty good, though. I’ve gotten above the recommended daily goals with 2,200 Monday and Tuesday. Yesterday wasn’t as good, I got started late, and didn’t get a ton done before I got tired. I’m aiming to make that up today, though. In other news, Scrivener for Windows is officially out now! If you can’t tell, I am a fan. I’ve used it since Dec of last year when they started the beta program. Go check it out here. Lastly, a little advice. As I was writing the other day, I found that my leader of the elves character was more selfish and foolish than I had first imagined. Heck, he was just using my MC as a power play. 7 chapters into the story, and everyone but my MC knows what is going on and why he is there. I really feels sorry for him, although he is taking it in stride. The story started to go in a direction that I hadn’t planned, and I was seeing possibilities. But, my MC still needed to know what was going on, even if the ruler was an idiot. The ruler is the one to tell him, or take him to the right person. That is sill in process. So, I had to rein things in a bit, and pull the “Author” card, and nudge them in the direction I wanted them to go. So far, it working. So, that advice? You are the writer, they are your characters. Yes, they take on characteristics that you didn’t know about before. They change as you go, sometimes. But, you are the one who is directing them. Use those quirks that come out, and let them work for you. You, as the Author, are ultimately in control of the story. Or, if things get really out of hand. You can always clean the slate and start with a new character. My ML did that with a gas explosion that killed everyone. See? You are in control. One last thing. You need to have a snack for NaNo, right? Here’s one I like. I don’t know where we got it, so I can’t attribute it to anyone, sorry. NaNoWriMo is upon us! I’m not a well-known blogger or author, so I’ll keep this brief for you. With only a few days of planning and plotting left, I wanted to give you an idea of what to expect from me. I’m not a prolific blogger, and that won’t be changing anytime soon. I will try to post some updates as to how I’m doing, and what I’m struggling with. Might be kind of fun to do a mini NaNo journal. Most likely what you’ll see are periodic updates, maybe weekly, as to how I’m doing. For those of you doing NaNo, Literature and Latte has a trial version of the excellent program Scrivener for NaNo up and running. 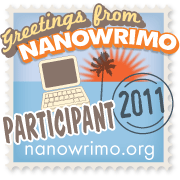 If you are interested, head here and check it out: http://www.literatureandlatte.com/nanowrimo.php. Finally, some hints for you as well. 1,667 words a day doesn’t sound like much. There are times it takes forever, and others where it takes no time at all. When you get stuck, move on to another spot in the story. Come back to that point when you’re ready. Make sure you join up with your region, and attend some Write-Ins! This might be the most important! They are a blast, get you out in a different environment (which can help your writing) and will introduce you to new people. And last, but not least, have fun. Writing is hard work, but if it’s not fun, it’s not worth it. Good luck to all of you. May the Words be with you!